Alfa Laval SG2-series of decanter centrifuges provides the most cost-effective, high-performance separation solution currently available for dewatering applications in the ethanol and biofuel industry. The world market for fuel ethanol is booming. Alfa Laval SG2 decanter centrfuges play an important role in enabling both new entrants and established players set up reliable, cost-effective processing facilities distinguished by low life cycle costs that help ensure solid profit margins. Alfa Laval SG2 range of decanter centrfuges is designed and built with the specific requirements of ethanol production in mind. SG2 stands for "spent grain, generation 2". With more than 400 units installed to date, the first generation of these units has been the preferred equipment in ethanol production for decades. The second generation consists of additional models and fine-tuned, improved performance for all existing ones. SG2 units are the most cost-effective high-volume separation solutions currently available for processing dried distillers grains and solubles (DDGS). Thanks to their well-balanced, straightforward design, unique control systems and the use of robust, abrasion-resistant materials, they operate more reliably and more efficiently than any other comparable equipment – even at centrifugal forces as great as 3,500 G. They are used to process high-volume throughputs of stillage from all grain types in order to achieve a low level of suspended solids and high cake dryness, with reduced power consumption and lower life cycle costs. The Alfa Laval SG2-700 model is the current culmination of Alfa Laval's ongoing programme of fine-tuning the SG2 design in response to the evolution of customer requirements. The result is a decanter centrifuge that provides the driest cake, the clearest centrate and the lowest energy consumption on the market. Using less energy for evaporation and drying has a direct impact on bottom-line results. The Alfa laval SG2-700 model also features both a lower price point and smaller footprint than any previous models, paving the way to innovative configurations. 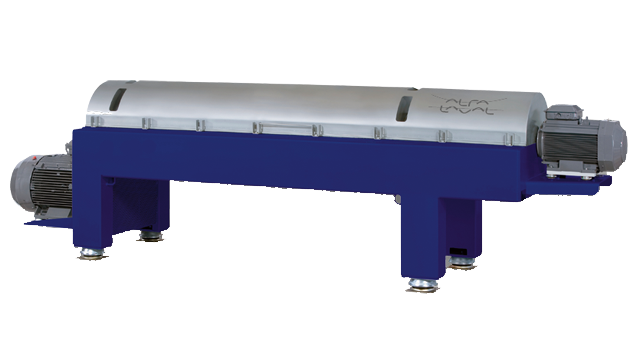 Alfa Laval SG2-700 decanter centrifuge for ethanol processing provides exceptional performance, featuring the driest cake and the clearest centrate with the lowest energy consumption currently available. centrifugal casting of the steel to ensure a uniform, flawless material that resists the effects of material fatigue inevitable in high-stress operations.